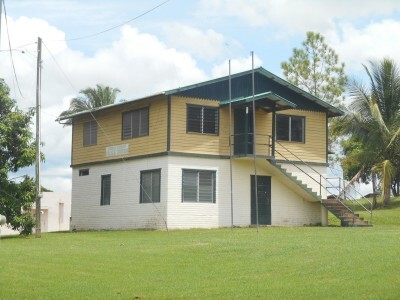 An unusual style House in Belize! Touring Spanish Lookout. I’ve mentioned before how Belize should not only be about beaches and snorkelling. 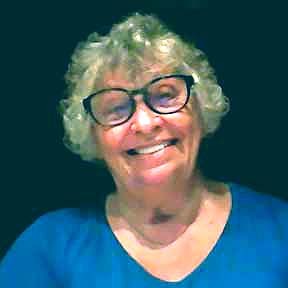 Having enjoyed the thrills of Caye Caulker and Ambergris Caye, I headed to the capital city Belmopan. And then we ended up touring an area known as Spanish Lookout. Yes that is the real name of this settlement but it’s not really Spanish…more like a community of Germans living in Belize!! We were out on an all day tour visiting other parts of inland Belize so we had a driver organised thanks to Nick at the El Rey Hotel in Belmopan. Our driver was local lad Shenley (he’s in some of my videos below). Hitch hiking isn’t a great option as cars in this remote part are few and far between as we found out when we had to hitch a ride back from Actun Tunichil Muknal. Despite the funky sounding name, you won’t be stood with a pair of binoculars looking for Spaniards, or even in the company of Spaniards. It’s a community of Mennonites here who speak Plautdietsch as their mother tongue (something similar to German or Dutch). 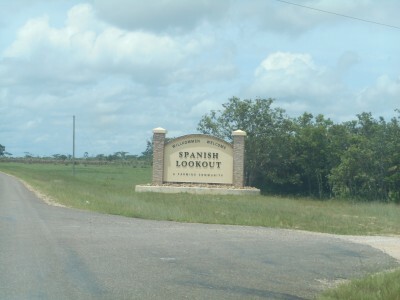 It’s a dispersed settlement in the Cayo District of Eastern Belize, with farms and scattered villages, and according to the 2010 census, Spanish Lookout has a population of 2,253 people in 482 households. 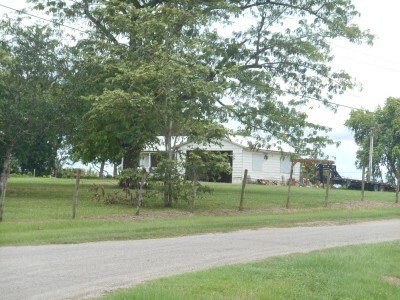 It is largely an agricultural community with some light industry. The best ice cream in Belize is made here and they also have a public ice cream cafe open to the public which we headed to. 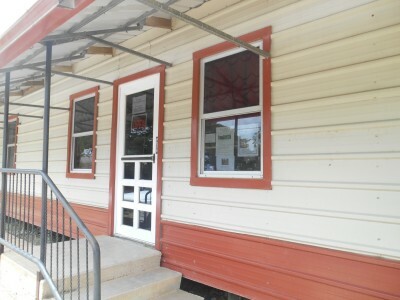 WD’s ice cream shop. I had independence ice cream which is red, white and blue (an irony in those colours given that the independence was from the UK!) and Panny had a cheesecake flavour ice cream. The ice cream was excellent. Panny and I with our ice creams at WDs, Spanish Lookout, Belize. Panny was looking for some oils and beauty products and the organic shop here in Spanish Lookout is one of the best in Belize, if not Central America. 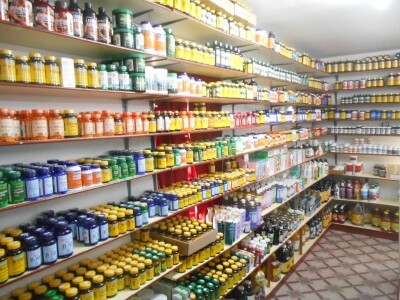 It’s name is Reimer’s Health Food shop – it is well signposted and known within the community here. 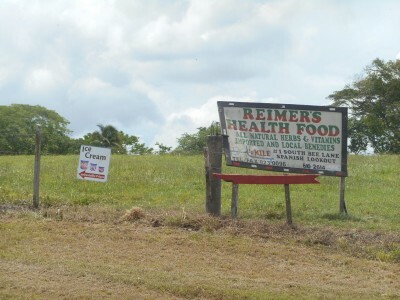 Reimer’s Health Food Store in Spanish Lookout, Belize. In fact it was this idea of Panny’s that took us out to this bizarre and unusual place. I have to say it was a cool trip and Panny got all the things she needed in Reimer’s. Panny shopping in Reimer’s Health Food Shop. 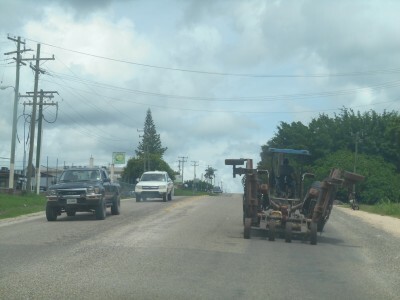 You’re in Belizean countryside here so farms are everywhere. There’s a chicken farm and factory called Dis Da Fi Wi Chicken which we only drove past but you can stop at. And so after touring Spanish Lookout we headed to the ruins at Xunantunich. We still never found out why the place is called Spanish Lookout and on all of my travels, this ranks as one of the most odd yet interesting places we were at. A video documentary of life in Spanish Lookout, Belize, from 1958 to 2008. Including Mennonite history. Interesting report. BTW - WD's is the logo for Western Dairy that does make good ice cream but they also make a full line of cheese and other dairy products. 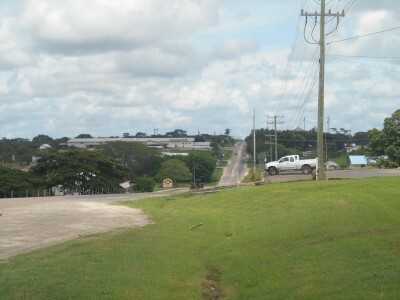 Spanish Lookout is also the best place for shopping in Belize. Universal Hardware has vast selection of everything "hardware" and is the best place to buy a motorcycle. The Farmer's Market is a large shopping center...hardware, electronic's, clothing, food, and just about anything else sold at reasonable prices. Several other stores include auto supply stores and the previously mentioned WD Ice Cream Store. 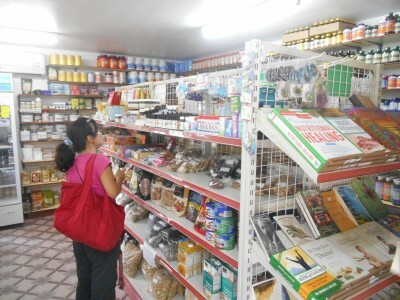 All stores in Spanish Lookout are very clean and the service is universally polite. I was struck by how neat, clean and orderly everything seem to be as soon as I crossed over into Spanish Lookout. A noticeable lack of roadside litter and buildings needing paint. 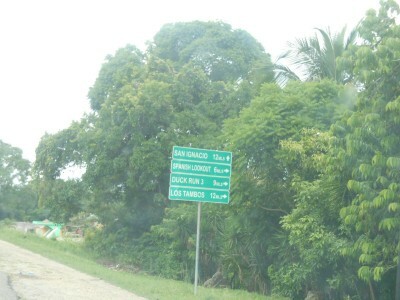 Why is this place different that most of the other towns in Belize? It is that was because the Mennonites themselves take care of the community. If you see the beautiful highway into from the bridge it is that way because the Mennonites themselves built it. They even produce their own electricity for their community and are proud to say that they have only lost power once in many many years. It is a society all unto itself and they do an excellent job of it!! !